Unmanned Surface Vehicles (USVs) are part of the unmanned maritime systems (UMS) market. Although such systems have been in use for decades, in the form of unmanned underwater systems (UUVs), the surface ones have recently started to come at the forefront. Only a few countries in the world have made them an integral part of their operations, while others have recently started setting up mission specific plans to procure such systems. This new trend will expand to the civilian market with oil & gas, engineering, safety, shipping and other companies procuring such systems to increase their efficiency and economies of scale. With most of the Earth’s surface covered by water, with around 40% of the population living near coastlines, with many energy resources found in the sea and with shipping being the arteries of global commerce, the USV market is a promising one. Being at its infancy, it offers great opportunities to the countries and companies that seriously commit to enter first and position themselves early on. 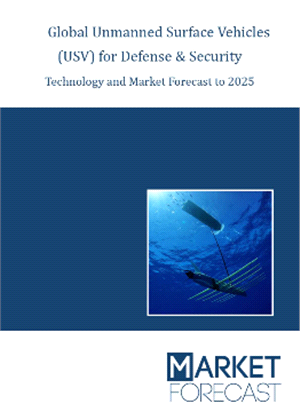 Market Forecast gives a detailed analysis of the military Unmanned Surface Vehicles (USV) market in the years 2018 through to 2025 in terms of in service systems and requirements per country, development programs, products available, leading companies and opportunities for manufacturers. The global USV market is forecasted to grow by 6.0% CAGR with consolidated $8.698 billion over the 2018-2025 period. Global market share assessments for all types in numbers delivered and value for 2018 to 2025. Market share assessments per segments and regions for 2018 to 2025. Snapshot on global security issues, defense budgets, spending patterns and how these affect the procurement of USV systems. Market Dynamics: An insight on the latest technological developments in the USV market and which countries are changing their preferences, are in position to absorb the new technology and adapt their modus operandi. Roles for all types: Insight on how USV systems can fit in a military or security concept of operations and how they form a revolution in military affairs. Main military USV technology trends. Market Trends: Drivers, Constraints, Opportunities, Threats, Challenges, Investment Opportunities, and recommendations for those that decide to move into the market at this early stage and stay ahead of the competition. Profiles for the leading companies, including financial information, strategic alliances and recent contract wins. Unmanned Surface Vehicles for Defense and Security. Unmanned Surface Vehicles in relation to Unmanned Underwater Vehicles. Unmanned Surface Vehicles for Maritime Mines Countermeasures; Anti-Submarine Warfare; Security and other missions. Market segments: Procurement, O&M and R&D. 1.7 How will this report benefit you? 2.2 Why a Surge of Interest in Unmanned Maritime Systems? 3.2.6 Case Focus: Should USVs be On-Board all Military Vessels? 4.3.10 Small or Large UMV? 6.4.9 Other opportunities in the Asian USV market. 8.1.2 Future Defense Market: What Lies Ahead? 8.1.4 The New Defense Procurement Fiscal Context of Europe and of the U.S.